Intermountain Healthcare has picked Heather Brace to be the system's second-ever chief people officer in as many years. Brace, currently a human resources executive business partner with Intermountain, also will be a senior vice president. Dan Liljenquist was named senior vice president and chief strategy officer. He's currently vice president of the office of enterprise initiative at the Salt Lake City-based system. Brace is only the second executive to take the role as "steward of Intermountain's people resources and to ensure Intermountain is a place where talented people want to work," which is part of the system's goal of maintaining its "position on the cutting edge of healthcare," CEO Dr. Marc Harrison said in a news release announcing the hire of the first executive, Joseph Fournier, in December 2016. He left that post in April. Two other Intermountain leaders, David Flood, senior vice president and chief development officer, and Doug Hammer, senior vice president of legal affairs and general counsel, will join Intermountain's executive leadership team. 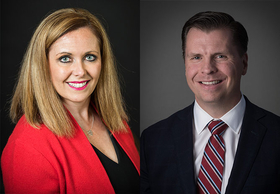 "I am confident their leadership will strengthen us and help us deliver better care and service to our patients and our caregivers," Harrison said in a news release announcing the new executive appointments. Intermountain in 2017 reported $4.6 billion in net patient services revenue, up 5.9% from 2016. The system has 22 hospitals, 170 clinics, a medical group with about 2,300 employed physicians and advanced practice clinicians, and a health plan.